Oops. As many of you have noticed, yesterday I accidentally posted my personal to-do list onto this blog. I realized my mistake only when a fellow Googler IM'd me: "any idea what's going on here? Just checked the blog, and there's a new (inexplicable) post." Soon after, I unpublished the post - because I'm assuming that you, our dear readers, aren't too interested in reading about my weekend activities (cleaning my shelves) and that I'm shopping for tofu and one large cabbage this weekend. Here's what happened: I was testing out a feature that allows you to create and edit blog posts in Docs and publish them directly to your blog. I picked a to-do list that my wife and I collaborate on for our weekend chores and grocery list. Then I clicked "Share" and "Publish as a web page" (thinking that I'd be posting to a test blog of mine). One button click later, my list was out there for the world to see. I've since changed my settings to not post to this blog. Embarrassed... yes. Next time I'll try to be a little less trigger-happy with the 'Post to blog' button. 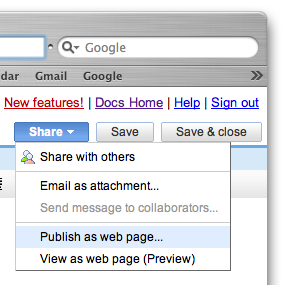 Update: Added link to the Google Docs Help Center describing how to post to your blog.